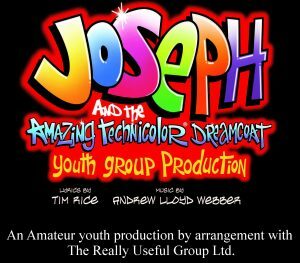 Thank you very much to Dee Way for reviewing Joseph – her report follows below, with performance comments being given to individuals in person. Thanks also to Evan for his photos from Saturday night, these can be seen on Facebook. 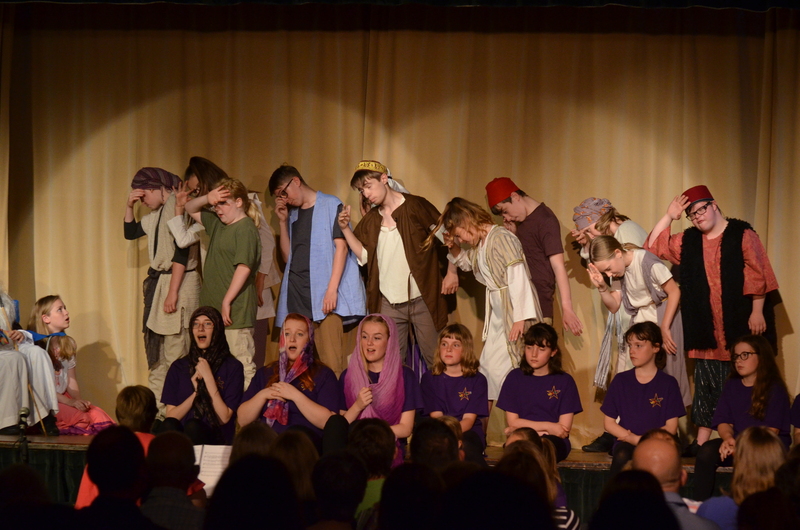 Thank you for your kind invitation to review your production of ‘Joseph’. This is a wonderful show, full of catchy tunes and good lyrics that make the audience laugh. The production business can be elaborate or fairly simple, but the show is quite complex to stage well, as the scenes change quite quickly and the narrators carry the storyline. Hence clarity of words and good body language are vital to this show. However, for this inclusive group, everyone who wants to can take part, leading to enormous enthusiasm and enjoyment all round. 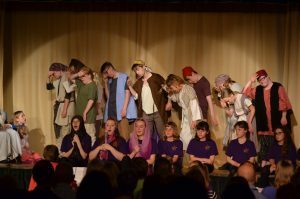 Congratulations are due to all those who helped the group to stage this production – they must have worked really hard! The way this production was organised was intriguing. There was both a conductor for the singers out in front and another for the small orchestra set behind the stage – who played very well throughout. The scene changes were undertaken by the cast on the whole, which worked very well and the main parts were well performed. There was also a large chorus of young children who were very entertaining whenever they came on stage. At times the balance between Joseph and the chorus needed attention, and occasionally the radio mics were not adjusted quite right, but on the whole this was an enthusiastic and well-organised production. The costumed welcome was nice, but it can be good to keep the main characters backstage, so that the element of surprise is not lost. The set was nicely varied, with a simple setting for the opening of Act 1. There were a lovely bowl and basket down stage right that somehow indicated both the geographical location and the historic period of the show. The move to Egypt was very nicely suggested with the mid-stage curtains drawn to reveal a golden pyramid and sphinx. The prison cell was very effective, using the shell of a hospital screen, while the hieroglyphs on the walls were lovely! The emergence of Pharaoh from the pyramid was very inventive and worked really well, with the chorus taking up Egyptian-style poses. I also liked the use of a star cloth behind the pyramid and the outline of a building – very atmospheric. The choreography was good in that it was fairly simple and very effective. The use of hand jive, shoulder hitches and sways worked very well because they were performed well – and with big smiles! The costumes added a lot to the production, in showing the poverty of Jacob and his family contrasted beautifully with the richness of the Egyptians. Potiphar’s jacket was splendid and his wife’s costume was very good. I really liked the removable collars and cuffs – they looked very impressive – as did the chorus’ costumes in the opening of Act 2, when they wore jewelled collars and golden wings. As for Pharaoh, his white suit was wonderful! The lighting was used to very good effect, with disco colours for the first scene in Egypt and some very good effects for Joseph’s cell. The effect of the glitter ball at the finale was nice, too. The sound had a few more problems on this occasion, possibly because of on stage costume changes. Mics were left on at times when people were back stage but only the odd comment floated through. It was the balance between the singers and the band that could have been more balanced, as at times the audience could only hear the chorus and not the soloist or the band was a little too loud. Perhaps this is something to work on? All in all, this was a lively, inventive and colourful production of a timeless musical favourite. The audience loved it and it was well performed by such a young group. Congratulations to everyone involved!